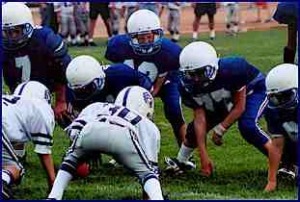 Today in America, surveys indicate that as many as two-thirds of children between the ages of 6 and 18 are involved in athletic activities— from team sports like soccer, football, softball, tee-ball, water polo and basketball, to individual sports such as ice skating, wrestling, gymnastics, swimming, track and golf. More than 60,000 parks, schools and neighborhood recreation centers in this country sponsor youth sports of some kind. Athletic activities provide a wide range of benefits to kids, from improved physical health to “quality time” spent with parents and friends. But there’s a basic dilemma that goes along with introducing children to organized sports: How do you teach a child to enjoy competition without instilling an unhealthy “win at all costs” attitude that may lead to professional or interpersonal problems later in life? That quandary goes back to the days of knights in shining armor; it was, in fact, the very reason why the Code of Chivalry was developed in the Middle Ages. In those days the line between ethical competition and ruthless self-interest was as thin as the edge of a sword. To combat the poor examples set by sports stars who lie, cheat and steal, many youth leagues and athletic associations are adopting codes of conduct and ethical statutes to help young players internalize the concepts of respect, fair play and sportsmanship. These codes emphasize graciousness, self-restraint, integrity and dedication — concepts that would have been very familiar to the armored knights of the Middle Ages. Knights in shining armor were the greatest athletes of their time. They were admired as both warriors and competitors, but it was their dedication to the ideals of upstanding and ethical conduct that made them heroes for many generations to come — just as sports stars who combine personal values and athletic excellence in today’s world continue to be held in high regard long after they’ve retired from the public eye. By emphasizing the connection between integrity, sports and the chivalrous knightly champions of old, parents and coaches allow today’s kids to learn more about the importance of ethical conduct on today’s “fields of battle.” To help with this, we’ve created The Athlete’s Code of Chivalry — a simple but effective pledge that incorporates the Seven Knightly Virtues. We hope that athletes, coaches and parents alike accept the challenge of committing themselves to training, playing and living by the Code of Chivalry as they pursue their athletic endeavors in the 21st century. I will have the courage to prepare myself mentally and physically for my sport, to use all my strength and skills in every game, and to never make excuses for my performance on the field. I will know and understand the rules of my sport, and I will play by those rules in all situations and circumstances so that every game is a fair and just competition. I will share my enthusiastic spirit generously with coaches, teammates, teachers, officials and everyone who works to make my sport possible, because I know that I cannot excel without the support of others. I will be gracious in both victory and defeat, recognizing that every test of my athletic skills gives me an opportunity to improve myself. I will be honest, truthful and responsible when participating in my sport, because the bonds of trust that exist between athletes, coaches and officials create a safe environment on the field. I will conduct myself with dignity and honor at all times, remembering that I represent the noble image of athletic excellence in every aspect of my life. I will possess a positive, hopeful attitude before, during and after competition, because participating in my sport is a privilege, and I want to look back on my experiences with joy and happiness. I will live by the Athlete’s Code of Chivalry, and I will do my best to always be an honorable example of sporting excellence for others to follow and admire. Scott Farrell has more than 25 years of experience in armored, full-contact martial arts in tournament societies and Renaissance Faires. He teaches courses in Western martial arts through the Team Touché Fencing Center in Del Mar, California.